Rainer Küschall was born on April 17, 1947. At the age of 16, he had a swimming accident that made him a tetraplegic and spent the next 14 years in clinics, hospitals and rehab centres for social and employment re-integration. Without pension or invalidity assistance, Rainer was dependant on his own ideas. Driven by his positive attitude and his never ending yearning to move ahead, he decided in 1978 to establish his own company (Paratec AG) and to develop lightweight wheelchairs that would provide his misfortunate companions and the disabled with more mobility and independence. With help from his wife, Martina, he developed the first wheelchairs and in the course of time, his apartment soon turned into a workshop. The production of wheelchairs quickly increased to dimensions that soon required an assembly shop and mechanics. Step by step, the küschall® wheelchairs became a synonym for mobility and innovation, and they were distributed into various countries. In 1986, Rainer Küschall founded the company "kuschall of America" and in the same year, he received the Designer award from the Museum of Modern Arts in New York for his pioneering developments of the "Competition" wheelchair. A new era in wheelchair production began. 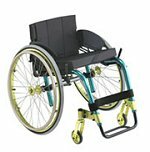 The self-supporting frame progressed to become the most requested wheelchair model world-wide. Today, many of the competitors build up their developments on the same concept. In 1988, today's küschall® manufacturing building in Allschwil was inaugurated. Two years later, Rainer Küschall founded the company "küschall of Chile", thus assuring a world-wide sales and service structure for the many küschall customers as well as for the various athletes sponsored by küschall. Rainer Küschall himself competed in 7 Paralympics and won 19 medals. In 1991, he was known as the fastest Tetra (quadriplegic) that even many paraplegic competitors feared. Shortly after having achieved the world's best marathon time, he decided to concentrate on his sales and supplier companies. In October 1995, küschall design ag joined the Invacare group and as of January 1st, 2001, the company name küschall design ag changed to Invacare AG. Today, küschall® is one of the leading brand names in the active wheelchair segment. 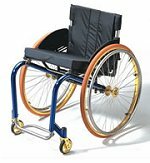 With its constant new innovations and developments, küschall® keeps setting new standards in wheelchair development. Thanks to the design and innovation of Rainer Küschall, many handicapped people can now do without electric powered wheelchairs, live their lives more independently, and, like küschall's slogan: "Find your lifestyle! ".